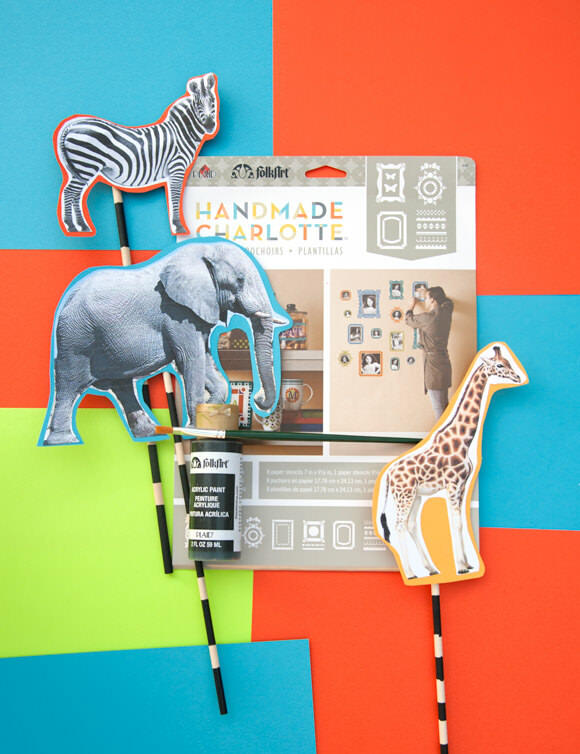 When our good friend Emily Meyer from Tea Collection asked us to create a DIY craft inspired by their latest South African collection of children’s clothes, the answer was obvious–of course! We’re huge fans Emily and her pioneering brand. 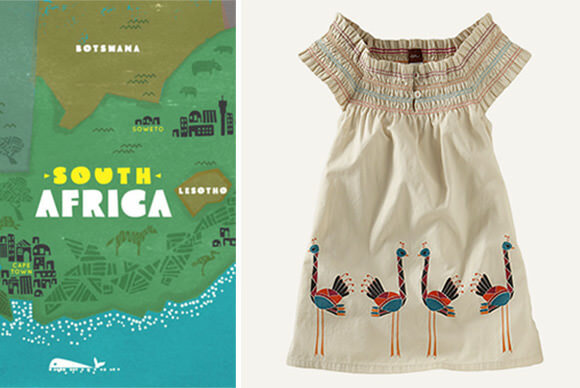 The designers at Tea Collection explore exotic destinations throughout the world and then translate those experiences by creating “globally-inspired children’s clothes for the little citizens of the world.” Their latest collection, and perhaps their best yet, invites you to explore the colors and patterns of South Africa. Be sure to check it out on the Tea Collection website! How do you celebrate a brand founded by two globe-trotting moms with more than ten years’ experience under their belts? You sound the bells and hold a parade, of course! 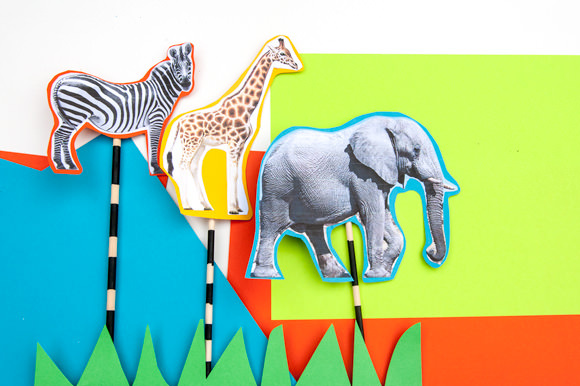 Here’s an incredibly fun DIY tutorial for creating your very own parade of safari animal puppets. You can whip them up in no time at all using just a few craft dowels, a little paint, and some paper. 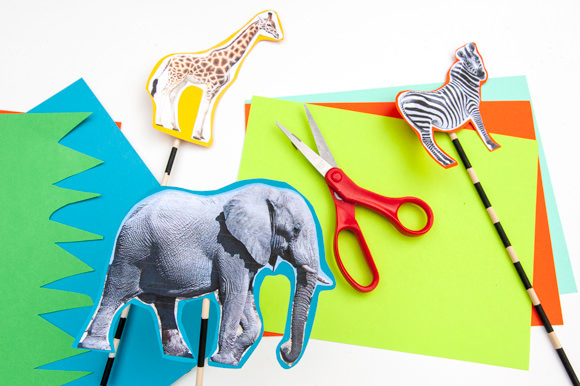 First, you’ll need to print and cut out photos of the safari animals (we found great pics on the National Geographic Kids website). 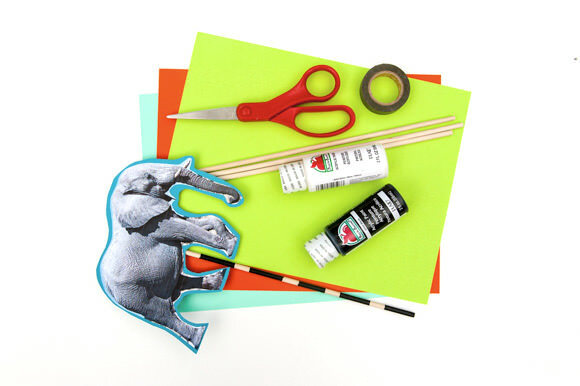 Next, glue the animals to sheets of brightly colored card stock and cut out the animal shape for a second time, making sure to leave a small border of colored paper visible around the animal. Time for the safari stripes! Using the handy border from the FolkArt Handmade Charlotte Frame Stencils (we know, shameless plug), apply stripes to the wooden dowels using black acrylic paint. Be sure to use your painter’s tape for clean, crisp lines. For even more fun, apply additional alternating stripes using white acrylic paint. 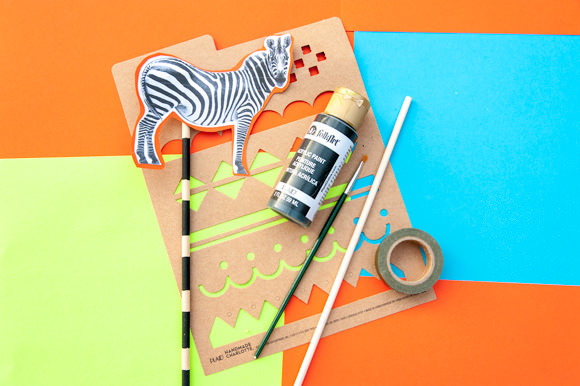 The border stencil makes the task of applying the striped pattern a snap for little hands (as well as yours), but you could also use painter’s tape to create your own safari-themed pattern. 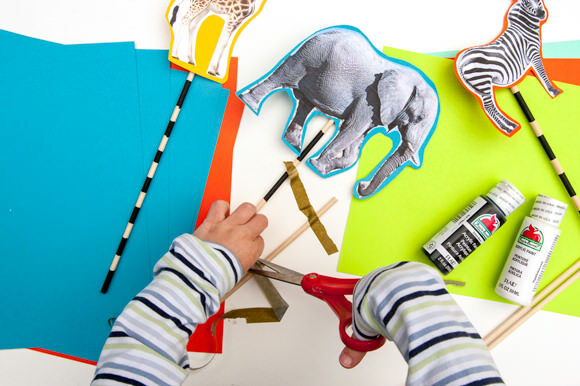 Now it’s time to turn the safari animals into puppets. 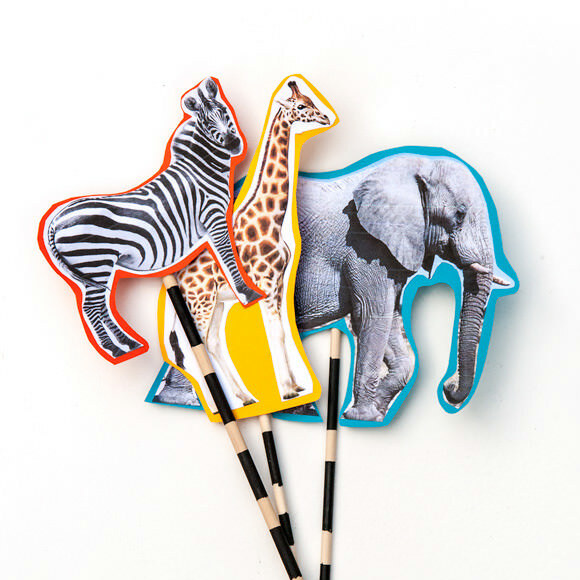 Simply tape the animal cut-outs to your freshly striped dowels. That’s it! 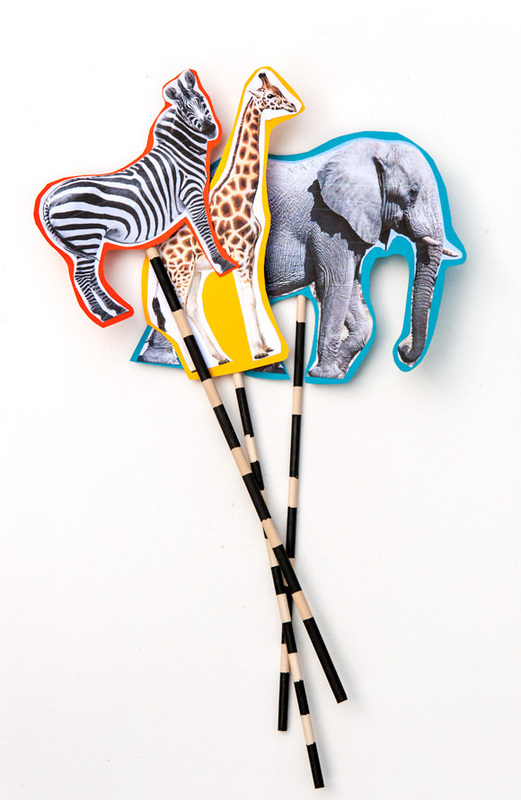 Sit back and enjoy watching your kids have a ball marching their new safari animal puppets around the house. These are too Rad! We often make little puppets at home but never go to the effort of making them actual “Keepers” think we might have to put a little more effort into the next ones. Thanks for sharing. NICE! We’ve just begun a Social Studies project with a friend from Swaziland, she is just two hours from Kruger National Park,. My kids are super excited about all the animals she told them about. This is a perfect “hands on” activity for us to do to go along with our project.